I have twin nieces in the US, both of whom are pregnant. No, they didn’t plan it that way! One is due in October; the other in December. 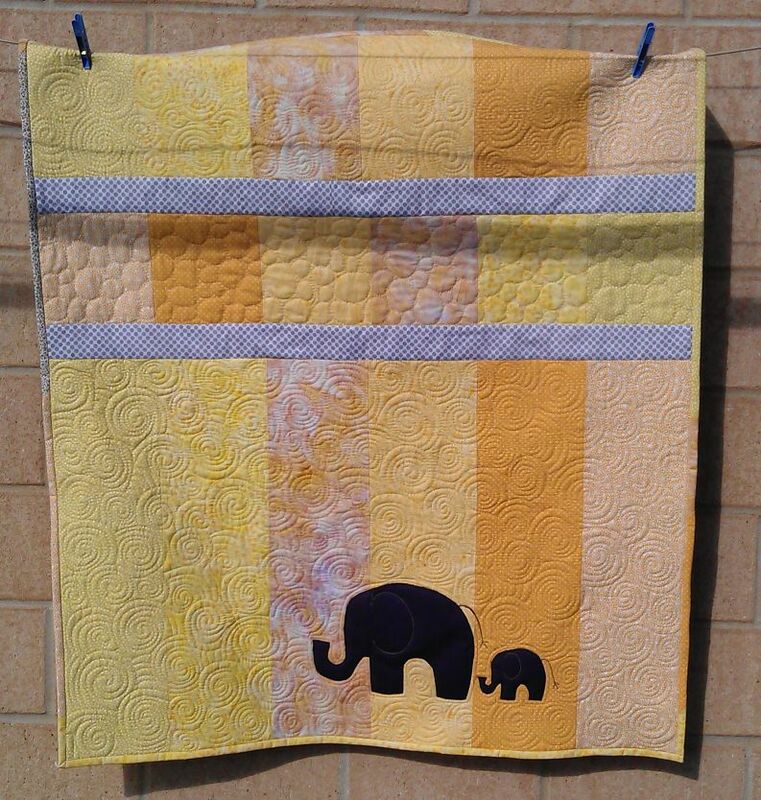 The one who is due in October has a thing for elephants for her nursery, so I decided to make a gender-neutral baby quilt for her in yellow, featuring elephants. And as I had enough fabric, I thought I’d make two at the same time, just in case the other twin got pregnant… And sure enough, she did! 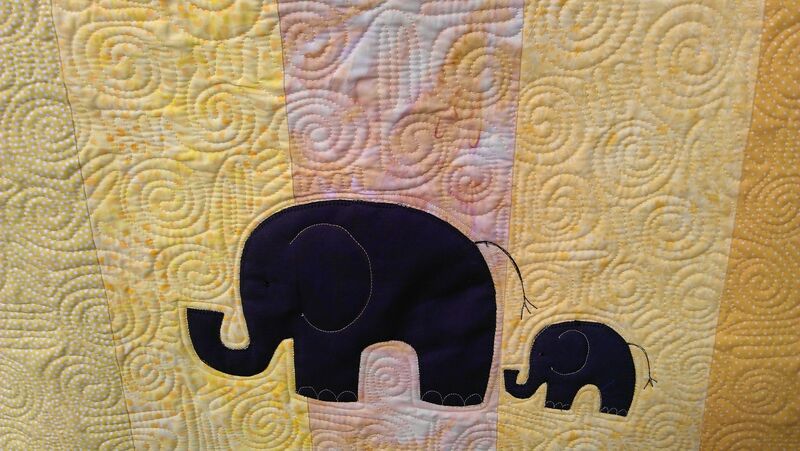 So now I’ll be taking two baby elephant quilts with me to the US in October. I really enjoyed making these quilts — the pattern was super easy to put together (‘Little black quilt’ pattern available free from: http://www.meandmysisterdesigns.com/patterns/?id=9). Just 6.5 inch strips, with a reverse strip part way up, separated by two bands of sashing. I didn’t have quite enough of all the fabrics to use exactly the same in each quilt, so the fabric choices are slightly different in each. But that’s OK. I also quilted them differently. For the first one, I made up a spiral motif with long U shapes, and outlined more elephants in the reversed panel; for the second I did all-over spirals, with bubbles/pebbles inside the reverse strip. The charcoal grey elephants were fused on and then I blanket stitched around them in black. I stitched their ear shapes and toenails in yellow thread, and their eyes and tails in black thread. 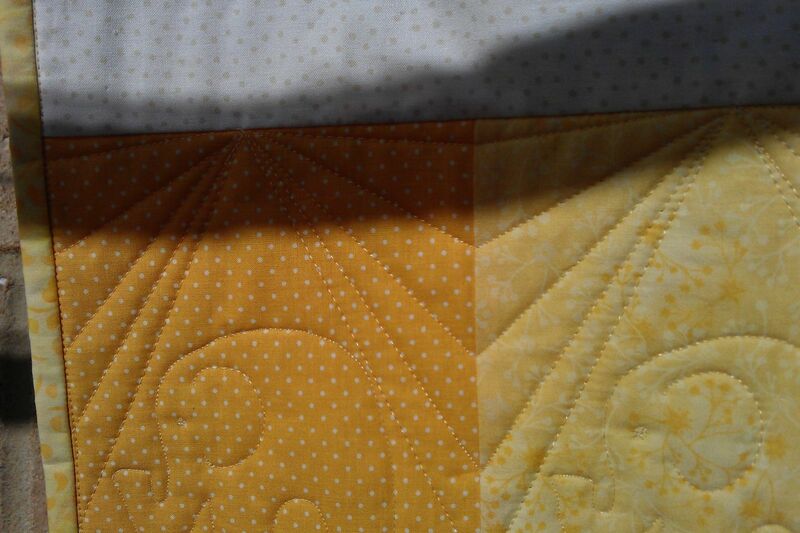 Finally, I added a binding made up of multiple pieces of leftover yellow fabrics. 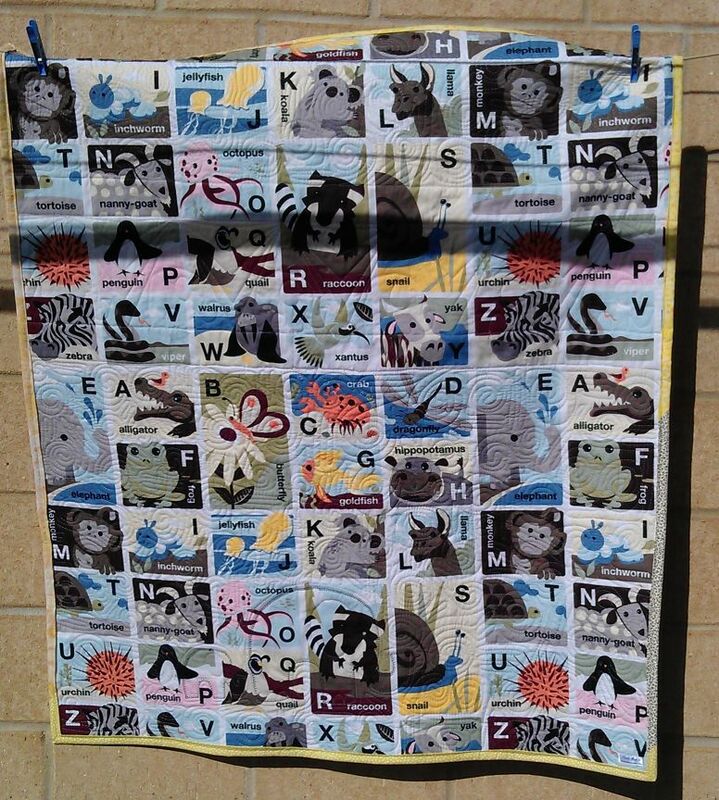 Oh, and the backing fabric was an alphabet print from the dressmaking poplins in Spotlight — it even has E for Elephant! 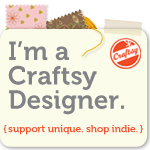 Interestingly, almost every yellow fabric I had had dots, spots, or circles of some sort! The quilting really does make the quilt! They are so adorable! U R so talented! So cute!!!!!! I love the yellow…..cheerful, sunshiny and perfect. The elephants are so sweet. Very interesting that both gals are pregnant!!!!! They will love those quilts!!!!!! !